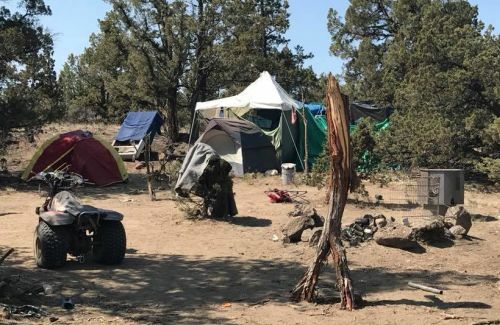 REDMOND, OR -- The Deschutes County Sheriff's Office estimates 30 to 40 people remain in well-established campsites, east of Redmond. The property, between Highway 126 and Antler, east of Ninth Street, is owned by Central Oregon Irrigation District, Redmond Schools and Deschutes County. 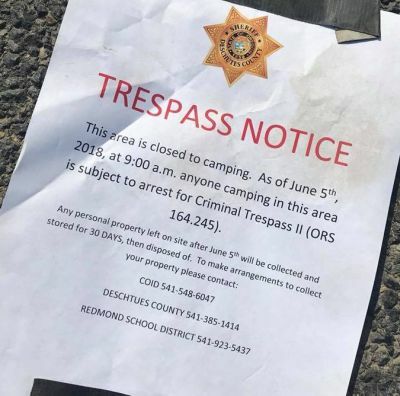 Campers have been ordered to vacate the property, but for those still living there, the big question is where they will go. Some of the smaller camps have already cleared out, many leaving piles of trash behind. But, as one woman described to KBND News, others are more permanent, "This guy here built a home here, he has like a structure." In another camp, Debbie (pictured above) and her husband "Schmitty" live in an RV. Unlike many vehicles in the area, their motorhome runs and has current tags. But, Debbie says, they only have a little gasoline and they don't know where to go once they're packed up, "We're going to try and go over on the other side of the canal up a little ways, it's supposed to be alright and there are people there. But I guess it's only good for a couple weeks, and then you have to move." She sent her husband to check out possible places, "I told him to go scout and make sure. I says, 'you don't want to drive into something and get blindsided.' We were told about the site with people, I guess, living there. I'm going to start working because I don't want to lose what we've got left here." Debbie is 60, a grandmother and she says she used to be a hospital dietitian. She has diabetes and, she says, when her husband lost his job at the mill, they lost their house. 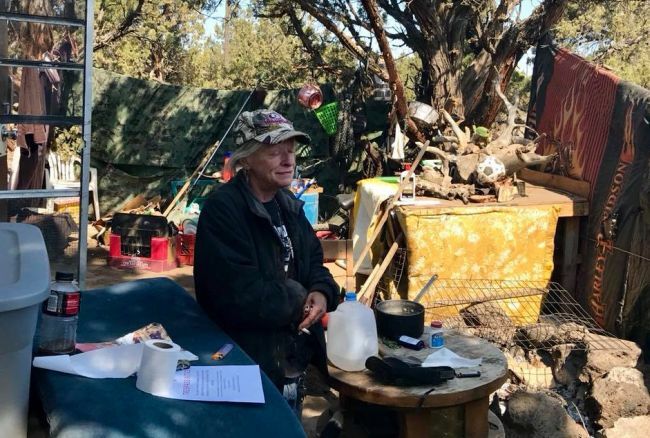 They moved to the site just south of Antler about a year ago, and Debbie says they had no idea it was private property until last fall when the last push was made by the landowners to get things cleared out, "They just want us out of here. That's basically what they want. The thing is, they want us all out of Deschutes County. The thing is, we paid our taxes; I worked for many years. It's scary and it's overwhelming. You know? I don't mean to cry." She tells KBND News, "I cleaned this place up; you should've seen when we moved in here. I worked my fanny off. I mean, I've got the animals and the birds coming back, and the rabbits. They come up in my camp and I feed them, and stuff. I've got a hawk that's adopted me. When we moved here a year ago, there was no sign of them. Nothing. Not even a lizard." She says they have family in the area but don't want to be a burden and at their age, she says it's difficult to find work. "Nick" lives in this camp, east of Redmond, and says he could clear out if he could get his vehicle running.